This dish is super creamy tasty and very rich. My mum used to make this for dinner and I have great memories of it as a family meal. In revisiting this, we found that this is really too rich as a standalone dish however, I think it is a great small starter for a dinner party. Gnocchi – I used shop bought as this was a mid-week meal, but you can make your own. Add the chopped chestnut mushrooms and let the mushrooms reduce in size. Meanwhile, crumble the Gorgonzola into a saucepan and add the double cream. 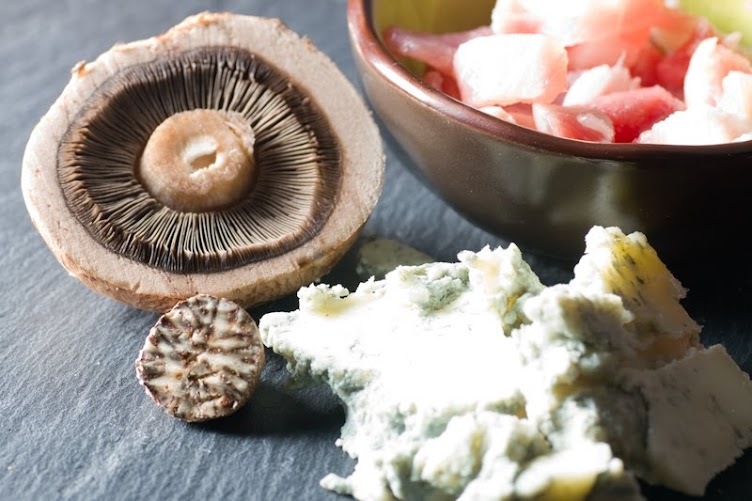 Melt the Gorgonzola over a low heat and stir continuously with a wooden spoon until the sauce is creamy. Add the nutmeg. Add the Gnocchi to the boiling water and cook for a couple of minutes until the Gnocchi float. Drain and fry lightly then add the mushroom and lardons. Pour the sauce over. You can add crumbled toasted walnuts to the top for texture and crunch. For a good fresh side, serve with a rocket salad made with a nut oil and red wine vinaigrette.